Once again the Brisbane Broncos will come under the NRL spotlight this Thursday night, and they’ll want to be firing when they welcome the Wests Tigers to the sunshine state’s capital. The club’s poor start to the season continued when they were humiliated 36-4 by the Sydney Roosters at the SCG last week, with several players including captain Darius Boyd and father Corey Oates failing to fire so much of a shot. Boyd, in particular, did nothing to prevent the Roosters from scoring several tries in the first half, as this tweet will highlight. Oates, meantime, confessed to playing one of the worst matches of his life but partly attributed it to the fact that his wife gave birth to a daughter two days before the loss to the Roosters. Overall, it was a dirty night for the boys from Red Hill; they trailed 22-0 at half-time, missed over 50 tackles and the full-time scoreline would’ve been larger had Latrell Mitchell not missed four shots at goal for the Chooks. Regardless, it was the Broncos’ worst ever loss against the Roosters, eclipsing a 28-0 loss they suffered in the final round of the 2000 season (though they would beat them 14-6 in the grand final four weeks later). Their halves pairing of Anthony Milford and Kodi Nikorima have also come under fire for another under-par display, with Channel Nine commentators Andrew Johns and Johnathan Thurston questioning the Broncos’ on-field direction under them. However, coach Anthony Seibold has given them a vote of confidence, set to name them as his halves against the Tigers on Thursday night. Add to that the two-week suspension prop forward Tevita Pangai Jr copped for his late shot on Cooper Cronk, and allegations of bad behaviour from injured centre James Roberts, and you’ve got a club whose culture is currently being questioned. But it’s not all that bad for the Broncos, with Payne Haas set to return from a club-imposed suspension against the Tigers, who after winning their first two games have dropped their last two to the Bulldogs and Panthers. After the loss to the previously winless Bulldogs, video footage captured coach Michael Maguire giving his players a good-old fashioned spray, his strict approach reminiscent of how his time at the Rabbitohs came to an end in 2017. Last Friday night against the Panthers, the Tigers were in good position to win until they conceded a try with two minutes remaining, and then were sunk in golden point when Nathan Cleary stepped up to win the match for the mountain men with a field goal. They now face a short turnaround ahead of their first trip to Queensland since July 2017, when they defeated the Gold Coast Titans by 26-4 on the Gold Coast. It will also be their first trip to Suncorp Stadium since they copped a 36-0 hiding midway through the 2017 season. Normally, most teams play at least one premiership match in the sunshine state every season, but in a weird fixturing quirk, the Tigers didn’t play in the state at all in 2018. It was the first time any club had been blanked out of playing in Queensland since 2004 when the Sydney Roosters were not fixtured to play in the state. Under this arrangement, teams would play against those within their pool once, and those outside of it twice. In 2003, the Roosters finished second, the Broncos eighth and the Cowboys 11th. By chance, the Chooks, at the time coached by Ricky Stuart and captained by Brad Fittler, drew the lucky straw and landed both the Queensland clubs at home. By contrast, they would’ve had to play the likes of the Panthers, Bulldogs and Rabbitohs twice. Back on topic now, and lighting the fuse for Thursday night’s clash between the Broncos and Wests Tigers will be the fact that Michael Maguire will come up against the man who replaced him as Rabbitohs coach at the end of the 2017 season, Anthony Seibold. Maguire was sacked as Bunnies coach at the end of that season after the club continued to regress following their 2014 premiership win – they were knocked out in their first finals match in 2015, and then failed to qualify for September in 2016 and 2017. 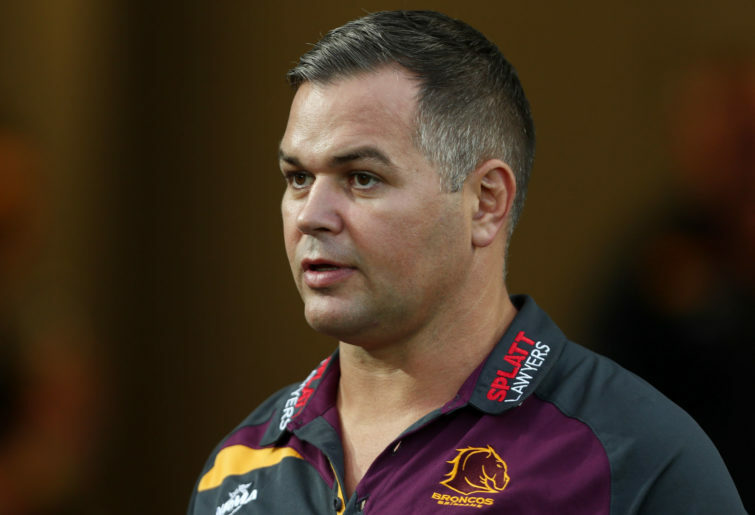 Seibold then transformed the club from a basket case into a premiership contender, taking the side to within a match of the grand final before the Brisbane Broncos came calling for his services in December last year. So far, the 44-year-old has found life tough going at Red Hill, dropping three of his first four matches in charge of the NRL’s glamour club, but whether they can improve going forward will remain to be seen. 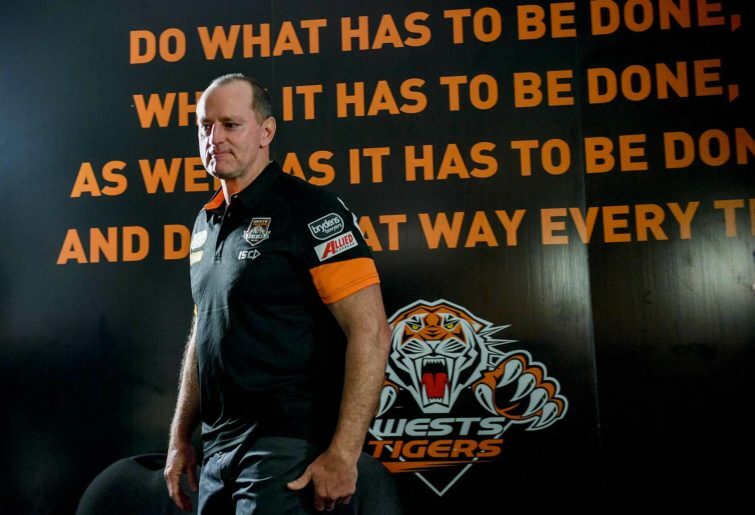 Meantime, Maguire would take the reins at the Wests Tigers after Ivan Cleary returned to the Panthers, and after overseeing two impressive wins over the Sea Eagles and Warriors, as mentioned before, the side have fallen to the Bulldogs and Panthers in the past fortnight. When you have two sides that are under siege following contrasting starts to the season, the expectation will be that both will come out firing as they attempt to get their seasons back on track. And I think that the criticism the Broncos have copped in the past few weeks should drive them to a big win on Thursday night.